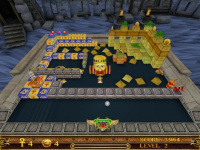 ScaraBall is a kind of 3 dimensional breakout or arkanoid game packed with ancient Egyptian themes. The main goal of ScaraBall is very simple, namely to destroy all bricks on the screen using a ball and a bat. Use the mouse to move the bat to the right or to the left in order to hit the ball. Don't let it fall or you lose. There are many powerups available that make the game feel more interesting such as tripleball, megalaser, shooting ball, etc. Take advantage of them to make the game finish faster and to get more points. Arcade-fantasy game where you will help Iris to find her sister, Siri.